Stoker lived most of his life in the Victorian era. One of the most obvious themes in the novel Dracula is the exploration of the strict and repressive Victorian attitudes toward sexuality. But Dracula is also an exploration of Victorian attitudes to death and mourning. After all, Queen Victoria is as famous for her strict codes of morality as for her role as the “widow of Windsor”. After the death of her beloved husband, Queen Victoria wore nothing but black for the rest of her life. Mourning jewellery became fashionable, and jewellery containing the hair of dead loved ones was popular. Queen Victoria particularly favoured jewellery made from Whitby jet for her mourning dress. Is it a coincidence that Dracula first lands in Whitby when he travels to England or is it a nod to the Victorian Queen’s favourite mourning gemstone? I don’t know. What I do know is that during Queen Victoria’s reign, mourning became an art in itself. And that brings us to cookies! Funeral cookies have a long history and are part of the customs related to eating food for the dead. Funeral cookies were essentially edible offerings that were handed out at funerals. They could be eaten at the funeral to honour the dead, eaten as snacks on the way home from the funeral or given as treats to those who couldn’t attend the funeral. They could also be kept as mementoes of the day. In Victorian times, homemade cookies were replaced by bakeries who offered made to order products on short notice. The evolution of printing technology allowed bakers the opportunity to package cookies in creative ways. Cookies could be wrapped in ornate wrappings containing printed information such as the funeral notice for the deceased, biblical quotes or poems. 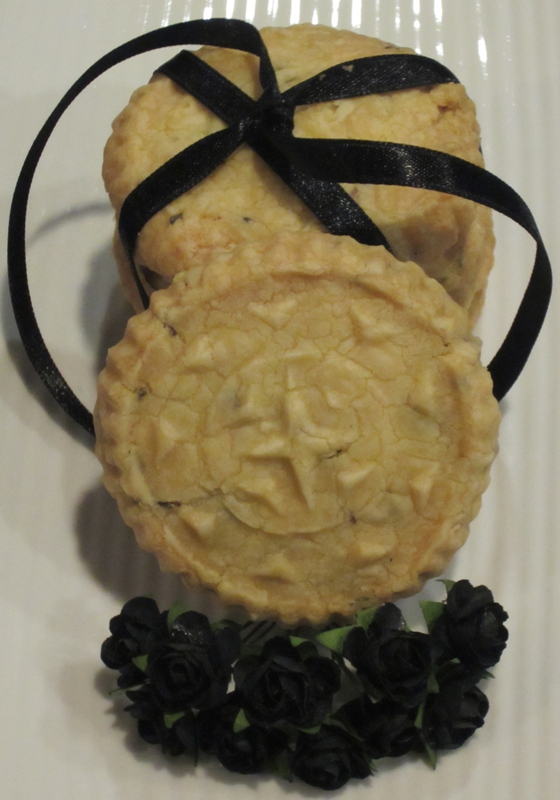 The Funeral cookies could then be used as funeral invitations with all the funeral details printed on the wrapper. If you were particularly peckish, you could even snack on them on the way to the funeral! I loved the quaint idea of a cookie wrapped in a funeral invitation so much that I decided to make my own version of traditional funeral cookies. My version is a shortbread style cookie flavoured with caraway seeds, which are a traditional spice in old-style cookies. I have added rosemary as it symbolises remembrance and is therefore associated with remembering and honouring the dead. I have also used a cookie stamp to give them an ornate appearance. Mix together the flour, cornflour, salt and caraway seeds. In a separate bowl cream together the butter, icing sugar and rosemary until smooth. Roll dough mixture into balls. Press into biscuit stamp lightly dusted with cornflour. Place trays in refrigerator for 15 minutes. Allow to cool briefly before placing on a wire rack to cool completely. That is all very interesting. It myst be where the custom of having cookies at viewings comes from. Pardon me while I head off to the kitchen to try these delicious sounding cookies! They are beautiful with the stamp as well as yummy sounding. I’ve only been to one viewing that I can remember and there were no cookies. But the feast at the graveside later made up for it! I am so happy you are regaining your love of baking!! If you are not using a stamp and the pastry gets too hard to handle you can roll it into a sausage shape between plastic wrap, refrigerate until cold, then slice. So glad you have your laptop back!! The cookies look delicious and I love the black ribbon around them very nice touch. I have been to a couple of viewings and there hasn’t been any food but like yourself some of the feasts at the graveside have been amazing. Can you tell me how many cookies it makes?…what size should the ball of dough be for 1 cookie? Hi Zedna, thanks for the question. The amount of cookies it makes and the size of the balls of dough depends on the size of the cookie mould you use. The one I used was about 2 inches or 5.5 centimetres across and about 0.5 inches or 1 centimetre deep. I’m sorry but I can’t remember how many it made. Hopefully I’ll get a chance to make them again soon and I can update the recipe. Patron saint of goths, I love that. She is also your namesake, how appropriate! I first got interested in Steampunk literature when I realized it was Victorian influenced. I have always loved Victorian things. The jewelry I have is onyx and topaz — two of my favorite stones. I looked up Whitby jet — it looks so beautiful, a perfect mourning stone! Ooh yes, I always loved Rufus! We will be getting season 2 of Victoria probably in the fall. Can’t wait! The second season is followed by a Christmas special plus I just read that it has been renewed for a third series! I’m sort of dreading but fascinated with how they would portray the death of Albert and Victoria’s reaction to it! Yes… I could think of a lot of creative ways to do it… We’ll see what they come up with, if they tackle it at all.